Ketupat is a type of dumpling from Indonesia, Malaysia, Brunei, Singapore, and the Philippines, made from rice that has been wrapped in a woven palm leaf pouch which is then boiled. As the rice cooks, the grains expand to fill the pouch and the rice becomes compressed. Left: Unopened bunch of cooked ketupat in a plate. This method of cooking gives the ketupat its characteristic form and texture of a rice dumpling. Ketupat is usually eaten with rendang (a type of dry beef curry) or served as an accompaniment to satay or gado-gado. 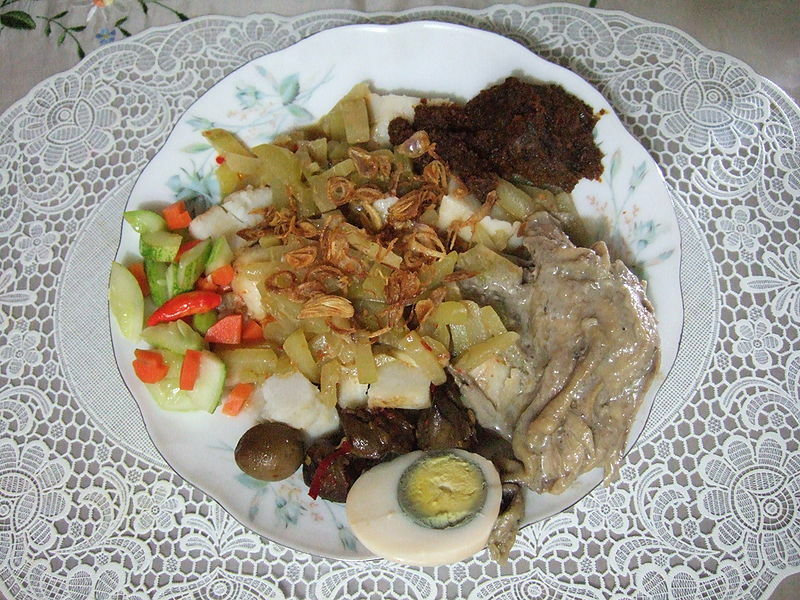 Left: Ketupat, Indonesian rice cake, with several toppings: Sambal goreng labu siam, rendang, opor ayam, telur pindang, sambal goreng hati, and acar ketimun. There are many varieties of ketupat, with two of the more common ones being ketupat nasi and ketupat pulut. 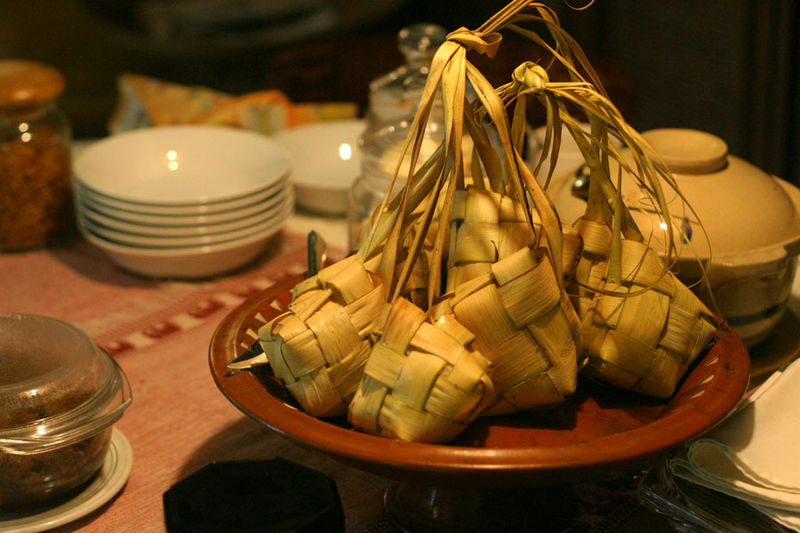 Ketupat nasi is made from white rice and is wrapped in a square shape with coconut palm leaves while ketupat pulut is made from glutinous rice and is usually wrapped in a triangular shape using the leaves of the fan palm (Licuala). Ketupat pulut is also called "ketupat daun palas" in Malaysia. Local stories passed down through the generations have attributed the creation of this style of rice preparation to the seafarers' need to keep cooked rice from spoiling during long sea voyages. The coco leaves used in wrapping the rice are always shaped into a triangular form and stored hanging in bunches in the open air. The shape of the package facilitates moisture to drip away from the cooked rice while the coco leaves allow the rice to be aerated and at the same time prevent flies and insects from touching it.